This cut is about 11 minutes longer than the Renegade release and a full 31 Minutes longer than the original American theatrical version. It has elements of the American Version, The Renegade Version, and the European Version. It has the original special effects with orange shield, and contains the fairytale ending. It retains the references to planet Zeist. In many scenes it contains different and/or longer dialogue and in many places, different music. This is what I have always wanted to see. 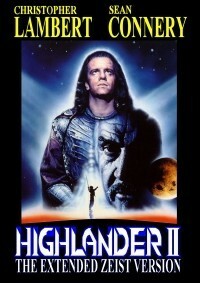 when i think of all the classic films i have yet to see i've gotta ask myself why i've seen highlander 2 so many times. 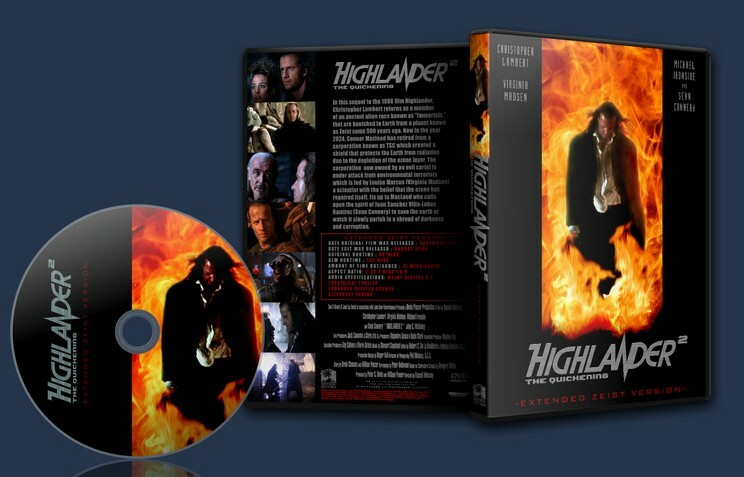 don't get me wrong it's awful when compared to highlander though i do believe it to be the best of the sequels, probably because connery is in it (though his character really shouldn't be) and i do love the scene when conner comes out of the fire a young man again. before the film the editor warns regarding the quality of footage that's been added but it didn't distract from my viewing experience. the footage is inserted as well as can but a couple of times the extra footage disrupted the narrative but i'm glad i watched this edit. 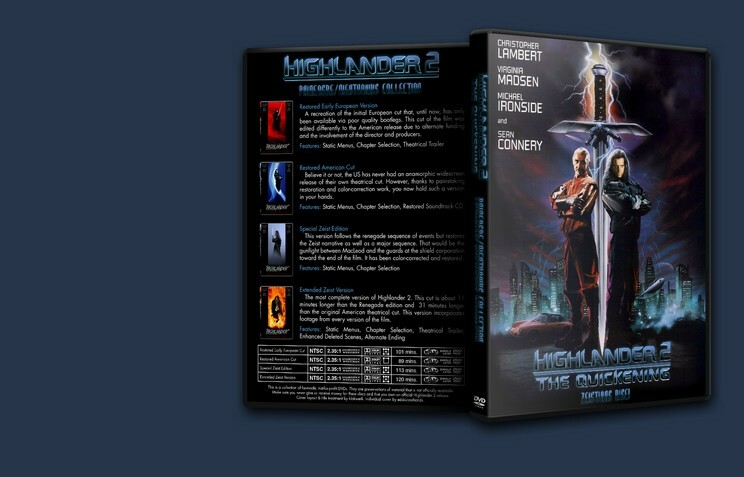 There have been many releases of Highlander 2 over the years. "Desperately passed from editor to editor in an attempt to save it. ", so to speak. But we all know there's no saving it. Indeed, this movie is an atrocity. It should be remembered, so that future film makers will never again follow in its footsteps. This fan editor has done a service by preserving the excised and altered elements and presenting this abomination in its full horror. The footage that's widely available (without the CGI corrections of later releases) is very high in quality. The European-cut exclusive material is poorer; it's obvious when sources switch. However, this is as good as that footage can look with the limited releases available, so complaining about it would be a moot point. The Renegade Cut exclusive footage is the worst of the bunch, but as far as I'm aware, that's a problem with the source material. Aspect ratio changes with each source, with subtle changes to horizontal letterboxing and vertical pillarboxing - the later is probably only obvious if you aren't watching with overscan. Some may find multiple aspect ratios bothersome, but I prefer this method. Better to have all visible picture data available than to crop it and lose some. Despite using a European source, everything appears to be in the proper 23.97 frames per second with pulldown. Audio sync is perfect. It should be noted that the movie (mostly) follows the editing structure and soundtrack of the European version. This makes sense, as it is the most complete Zeist flavored version of the film out there. However, this also means that the awkward flashback intro and continuity-error filled final battle of the American theatrical version are now in their correct places in the film. I found myself missing some of the music from the American version as well - a second audio track may have been warranted. However, the presence of the legendary extended ending more than makes up for their absence. There's a collection of other deleted scenes as an extra feature. This is always welcome, but I'm confused as to why they weren't included in the edit proper. All in all, this is an admirable effort. Anyone who wants to experience one of the worst sequels ever made in its full context should look into this edit. The Highlanders II was a horrible movie, maybe the worst of the saga, including the new ones. For that reason, I think that it was a brave move from PhineasBg to try to do something with it. I decided to watch the Extended Zeist Edition because I did not like the renegade version and I think I chose right. The film is still not bad and there are some points that are just stupid, but that is how this movie is and this fanedit could not have been better.